Republican White House hopeful John McCain said Wednesday that President Bush made a mistake after the Sept. 11 terror attacks by encouraging people to shop rather than urging citizens to join the military or volunteer. "I believe that the big mistake that our leadership of our nation made after 9-11 is we told people to go shopping and we told them to take a trip," McCain told students at a military prep school in this early voting state. A month after the attacks, Mr. Bush said, "We cannot let the terrorists achieve the objective of frightening our nation to the point where we don't conduct business or people don't shop." 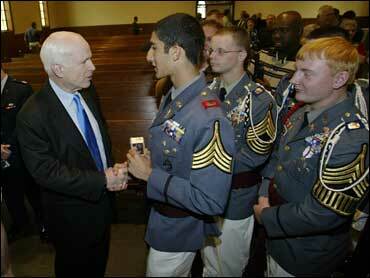 People would have joined the military or volunteer groups had the president urged them to do so, McCain said. "I think Americans would have responded overwhelmingly and I believe they still will," he said. The Arizona senator made the comments critical of Bush on Wednesday after shelving a prepared speech that was highly critical of Democratic front-runner Hillary Rodham Clinton. McCain said the original text of his speech was similar to an address he'd already made and that his differences with the New York senator remain a "legitimate issue." Excerpts of the original speech he was to give at the Camden Military Academy - which were released Tuesday by the McCain campaign - accused Clinton of indecisiveness, arguing that won't work for a post-Sept. 11 commander in chief. "The Democratic front-runner wants to have it both ways when it comes to foreign policy. On the one hand, the New York senator voted for the Iraq War. On the other hand, she now opposes it - sort of," the prepared remarks said. "On the one hand, she wants a firm deadline for retreat. But, on the other hand, she says we cannot abandon the nation to Iran's designs," the speech said. The Clinton campaign said Tuesday the two senators, both members of the Armed Services Committee, "have an honest disagreement on the war." "Senator McCain is the Senate's biggest supporter of President Bush's escalation there. Senator Clinton wants to end the war and when she is president she will," Zac Wright, Clinton's South Carolina spokesman, said in an e-mailed statement. McCain spokeswoman Brooke Buchanan said McCain's decision to not give the speech Wednesday had to do with the venue. Camden Military Academy is for students grades 7 to 12. "It has nothing to do with the content of the speech," Buchanan said. "This isn't the appropriate venue for that." Late Tuesday, McCain said he had not yet seen the remarks. "But I will look at them very carefully," he said. Buchanan said Tuesday that while McCain had not seen the language in the speech about Clinton, he still planned to deliver the critique.